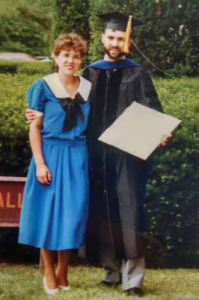 Thirty years ago James “Jim” Rancourt was a graduate student in the final stretch of the Ph.D. Chemistry program at Virginia Tech. He had two young children at home, both less than three years old. He also had an emerging dream. 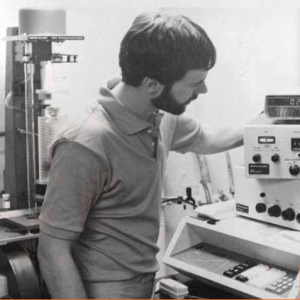 This dream was to have his own polymer testing company to solve materials science challenges in the “here and now.” He also had a dream of being able to live in the New River Valley, a place he had come to love over the course of his studies at Virginia Tech. Now, Jim has fulfilled his dream and so much more. It has been 30 years since our company was founded. Jim is now Dr. Rancourt; and his hair isn’t as black as it used to be (or black at all for that matter). He also went from having two small children to having four adult children and four grandchildren. A lot has changed in 30 years. Specific to the growth of Polymer Solutions Incorporated (PSI), there have been many exciting changes, some Jim never saw coming. In the ear ly days, Jim worked from home. He set up an in-home office and rented lab time from Virginia Tech to conduct analysis. Over the course of the last 30 years PSI has continuously outgrown spaces. The first “real” office space was at the Corporate Research Center in Blacksburg, VA. While there, the company expanded or moved a total of three times. Then, PSI relocated to the Blacksburg Industrial Park and stayed for a few years, also expanding as needed (i.e. bursting at the seams). 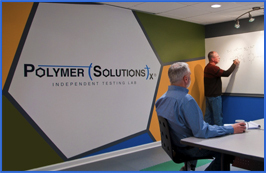 Ultimately, in 2015, PSI celebrated “The Big Move” and began occupying a custom-built, state-of-the-art testing lab designed to specifically meet our needs. This was a huge milestone for our company and represents the big growth we have experienced over the years. “Our building exactly suits the caliber of our company, supports our workflows, and meets the expectations of our life sciences clients,” Jim said. Our space is a true testament to Jim’s hard work, business acumen, and dedication to PSI. 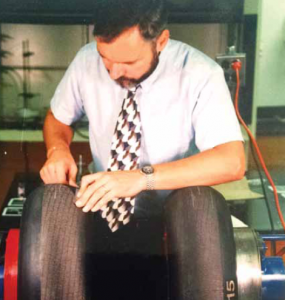 Over the years the types of materials we have tested have changed and grown in exciting ways. The materials we test literally go all over smallest of materials. Jim said, “Being able to see the iron atoms on the end of a bioactive molecule is a great demonstration of our ability to analyze nanomaterials. When I started PSI “nanomaterials” wasn’t even a prevalent term for describing materials.” We test materials that go deep into the earth for energy exploration purposes. We also test materials that leave this earth and journey to outer space. How amazing is that? Jim never established or grew PSI with an expectation of his family joining the business. “As the business has grown opportunities have been created that utilize the unique skill sets of some of my family,” he shared. Perhaps most notably is how Cynthia, Jim’s wife, joined the PSI team and is now the CEO. Cynthia started in a support position with an affinity for quality systems. She grew in this role and became Director of Operations, COO and is now CEO. Reflecting on the last 30 years brings up feelings of nostalgia and admittedly a healthy sense of pride for what our team has accomplished over the last three decades. We are proud of Jim and his willingness to dream big—and when that dream is achieved, continue to dream even bigger. Do you know what is more exciting than reflecting on the last 30 years of PSI? Looking ahead to what is in store for us in the coming 30! Congratulations! Thirty years and counting. Great photos and insightful story line. Two things that stand out for me as a customer are the commitments to (1) technical excellence in problem solving and (2) customer partnering. My experience has been that PSI can be counted on to tackle the tough challenges and deliver in a way that often exceeds my expectations. Results are not only “air-tight,” but are “Helium-tight,” and each project/submission is consistently treated as an opportunity to collaborate and learn, rather than just to check it off of the job list and move on. Again, congratulations, and all of the very best to the PSI team moving forward. Wow – thank you so much for the kind words! We are glad our team has had the opportunity to partner with you. Amazing copywriting. A well written article. Enjoyed it till the very last paragraph! Thank you for sharing why rubber dry rots and gets sticky! Thank you for the kind words – Stay curious!